The thyroid body type is one of four different types in the body type diet. If you've been wondering, "What is my body type?" the description following describes the Thyroid Type. The Thyroid body type tends to gain weight around the middle, like a spare tire. When you determine your type and eat for your body type diet you will lose weight if you need to, gain energy, strength, stamina, heal what ails you and transform your life. That's what happened to me. When I changed my eating to the body type diet, I completely transformed my health and my life. Read more about my story on the page, what is my body type. Now I help my clients do the same. Contact me to learn how to eat right for your body type and transform your health! The thyroid gland influences the nervous system and growth. It is also one of the glands responsible for sleep, active during the day and quiet at night. This in turn describes the Thyroid Type. You are an early riser. Morning is the best time of the day for you. You wake up early, often 6 or 6:30 on your own without an alarm clock, ready to take on the day. Other types may fare well at night, they are night owls. Not the Thyroid Type, early to bed, early to rise is a perfect plan for you. You may think that you have a lot of energy in the morning and consider yourself a morning person. Many of my clients believe this. However, often, they must be up and at ‘em early as they have children to get off to school and a lot going on. What time would you sleep in until on the weekend if no one woke you up? For a Thyroid Type would be maximum 8 AM. Other types can usually sleep in later. Usually the Thyroid Type is tired every day at the exact same time. You get tired easily but recuperate quickly. When your type is unbalanced your energy is up and down during the day. 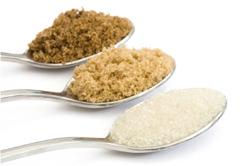 Often you rely on stimulants and sweets to boost your energy back up. Low energy times coincide with the time when your cravings are strongest. Often you have an energy crash around 4 - 4:30 PM, late afternoon. Your energy can also be low at 10 - 10:30 AM, or late morning. Your energy can go back up after dinner, back down at night before bed and at 4 AM if hypoglycemic or having nightmares. Generally the Thyroid Body Type does not fare well with staying up late. You are ready for bed by 10, 10:30. If you do have a late night you will be very tired the next day and it may take you two days to recuperate. The thyroid gland is the gland of feelings, pleasant emotions, sentimentality, movement and rapidity. Decorum is very important. When you are depressed, have fears, or feel sad, this indicates that your thyroid is unbalanced. It is also the gland of adaptability, vitality, as well as delicateness. 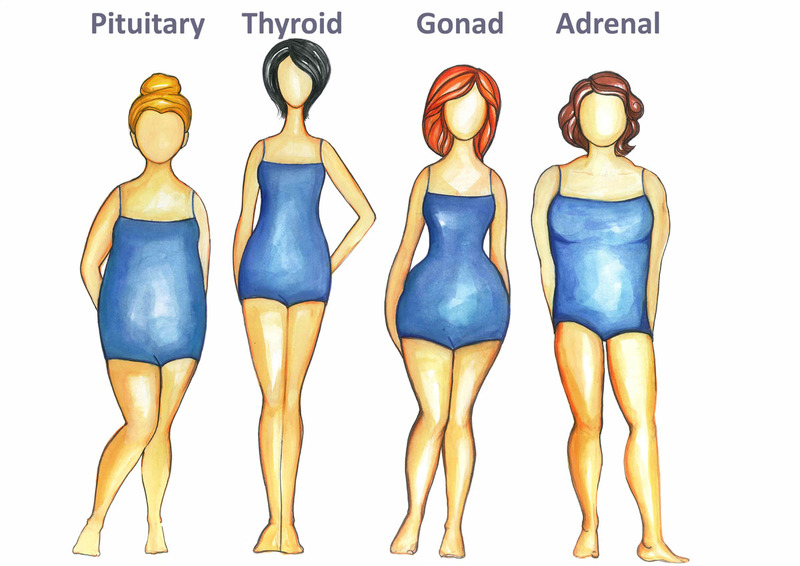 Thyroid body types express themselves well. You are eloquent and many of you are writers. You may use your hands to gesture a lot as you talk. You are vivacious, intelligent and entrepreneurial. You love sensations and things that will excite you. You have a passion for new things, things outside of the ordinary and sometimes tend to leave projects unfinished and move onto your next creative venture. You love change because it stimulates you. If you are unbalanced, your energy is very unstable, ups and downs during the day, having a strong influence on your mood. You are very sensitive and emotional. Your mood changes very quickly, from excited and pumped up… to feeling down and defeated, from creative… to negative and destructive. You are quick to react and have a nervous energy. You can be impatient. When angry, your anger is most often aimed at the situation rather than the person. You are abrupt and you get straight to the point. It is not a good idea to contradict Thyroid Types. Your memory is strong. You tend to work too hard. You take on a lot and you never stop. It is very hard for you to be idle, although you do tend to be easily distracted. You are easily drawn into excess, can get impatient and angry. You have an abrupt character. You get straight to the point. You are the most delicate of all the types. What bothers you and exhausts you? Sentimental let downs, heart breaks, divorce, conflicts, being rejected. Feelings of being overwhelmed, insurmountable objects, frustrations, overwork, over-thinking, overdoing, monotony, routine, situations requiring power, stability and endurance. For women, when pregnant you feel trapped and you can’t wait to start doing your own things again. You need more fresh air. You need to learn to rest. Cravings tend to be strongest at 10:30 AM, at 4:30 PM, before bedtime and at 4 AM. You have a good, large appetite and a strong, fast digestive system and you do not have a tendency to gain weight as much as some of the other types. Thyroid Body Types are prone to ailments involving the nervous system. You take on too much and you use stimulants and sweets to keep on going. If you continue this way it can lead to burn out depression, colitis, ulcers, cramps, intestinal spasms and diarrhea or constipation. The digestive system is directly related to the nervous system and most digestive ailments originate from emotional issues. You can be prone to poor digestion, heart burn and acid reflux. Your body is often overly acidic, leaving you prone to osteoporosis and joint pain. You are known to be prone to fears, fears of emptiness, insecurities, claustrophobia, nervous tics and fatigue. You rarely have high blood pressure although you do have palpitations or tachycardia. Your veins are very sensitive to the touch. You need to recuperate, recharge. A Thyroid Body Type is generally tall, thin, with long arms, legs and long extremities, fingers and toes. When thin, you have a delicate appearance and thin bones, small face and thin neck. You tend to have dry skin and hair, hair that breaks easily and you go grey earlier than others, generally around forty years old or before. Your excess weight tends to accumulate around the middle of the body. You tend to gain weight on the stomach, lower abdomen, soft low fat around the middle, a spare tire, curves and rolls of flesh, gaining weight on the hips and upper thighs. You don’t tend to gain in the face arms or legs. You have small facial features and a thin neck. You perspire very little. The lower back is straight, the buttocks round but not pronounced. Women do not get cellulite. In order to help The thyroid body type and other body types attain optimal health as I have, I put together the Natural Ways to Lose Weight Program. For guaranteed, lasting weight loss, Contact me today! I've helped hundreds of people eat right for their body type and lose weight permanently. As a certified naturopath and weight loss specialist I do consultations by Skype, phone and in person. Or.... I encourage you to click here to confirm what your body type is and get all the information you need. Follow your body type diet and lose those last 10 to 20 pounds. With the simple steps outlined in Natural Ways to Lose Weight you can easily achieve your weight loss goals and increase your energy as so many of my clients have.